Itai, Marina and I took advantage of the long weekend and headed out to Bishop on Friday morning. The weather was crisp and cold and it finally began to feel like real fall weather - psych was high! Following the morning ritual of grabbing coffee in town, we drove straight to my project (where we met up with Pete). I warmed up to the best of my ability and decided it was time to get on it. My first go went alright. I fell on the second move. It was a warm-up burn. I took a 5-10 minute break and hopped back on. I stuck the second move and knew it was time to capitalize. I moved through the upper section with beta I had never tried before... but when it works, it works! I can't really put in to words how excited I am to finish this one up! This send means the world to me, and I'm sure my brother feels the same way (about his). We had our eyes set on The Swarm since last April when we knew we would have some free time this summer for training. In late spring we reached out to Taylor, our climbing mentor (from back in the day ;p) and worked together to figure out some specific training that would benefit us most. Then we got to work. I had no idea what to expect as far as results go. So happy with this one. And a huge thank you to everyone who helped and supported along the way! 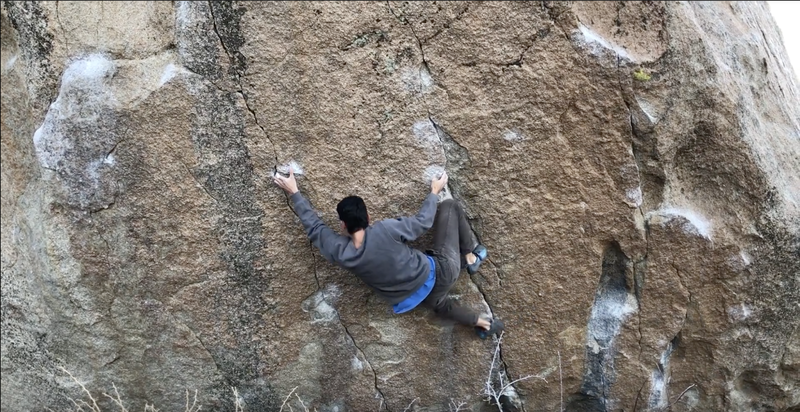 Me sending The Swarm (V13/14)! After my midday session on The Swarm (V13/14) we headed down the hill to the Get Carter boulder so Itai could jump on one of his last remaining projects in the milks - A Scanner Darkly (V12). He put up a fight and eventually put it down! We spent the next morning in the Buttermilks main area and met up with Cody and Wynne. Marina got to jump on her long standing project High Plains Drifter (V7) - and she got super close! After that we ran out to the Bardini boulders where Itai got on A Maze of Death (V12) and managed to figure out his beta and get really close to sending. I'm sure it'll go next trip! On Sunday we only had a half day, and spent it in the main Buttermilk area. Marina continued working on her project and Itai and I were able to make quick work of La Belette (V11) with the help of Pete's beta.